Oven Roasted Turkey Breast | Bone-In With Gravy! Sometimes, celebrating the holidays means gathering only your spouse and pets around the dinner table. 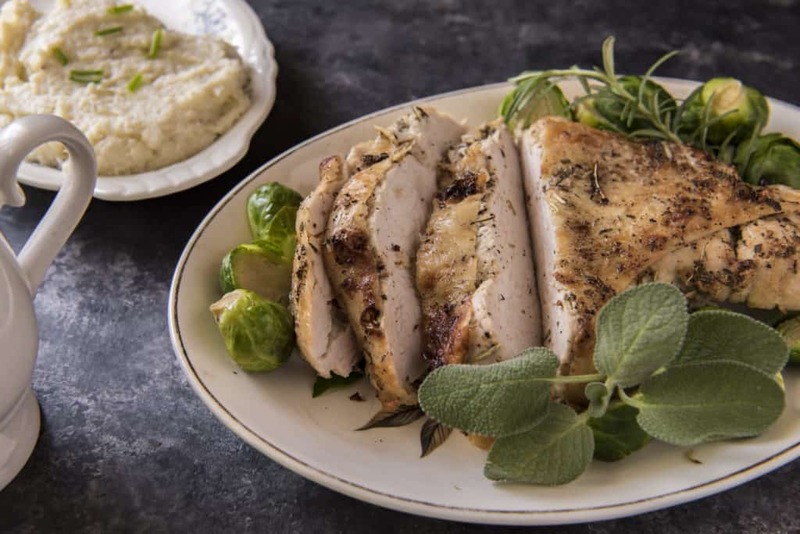 For us, Thanksgiving is always just the two of us, which is why we made an Oven Roasted Turkey Breast recipe. There is no way we can polish off a twelve pound turkey, but that doesn't mean we can't share in the deliciousness. Why Bone In Turkey Breast? Turkey breast is infamously known for being the driest piece of meat. Therefore, buying it and cooking it bone-in can help salvage whatever juice there is. The meat closest to the bone, no matter the cut, is always going to be the most juicy. If you can manage to get your hands on a bone-in ribeye, you are in for a treat! Grab that sucker and forget the turkey this holiday season. All We Want Is A Juicy Turkey Recipe! Can I be honest with you guys for a moment? It's impossible to come away with a juicy turkey breast whether you roast the entire turkey or just the breast. 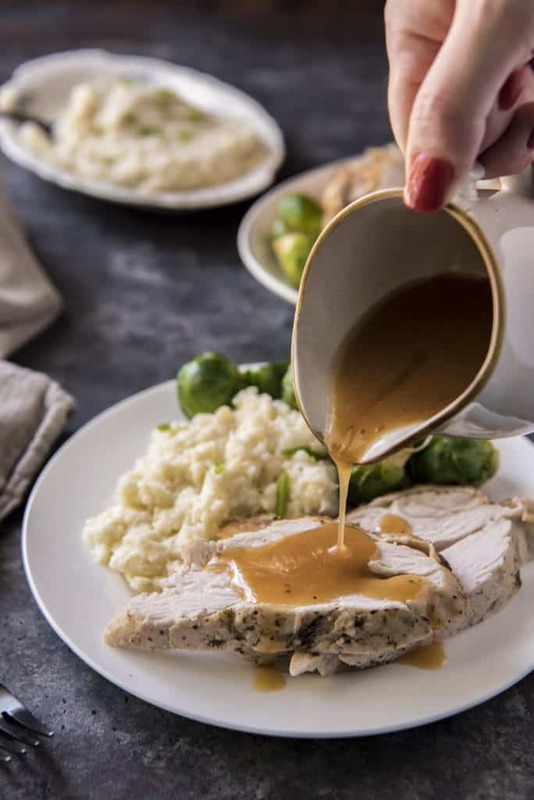 For this reason, we have paired this easy oven roasted turkey breast recipe along with a delicious gravy to save the day! If you're celebrating this holiday season with a small group of people or even just yourself, this recipe is a great way to tailor Thanksgiving dinner to you. Traditions can be fun, and eating turkey during the holidays is definitely one of them. With our oven roasted turkey breast and easy gravy you won't have to stress over Thanksgiving dinner this year! 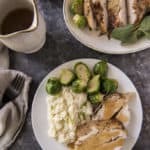 Recipe can be quickly added to MyFitnessPal - Search "KetoConnect - Oven Roasted Turkey Breast"
Preheat your oven to 375 degrees. Pat the turkey dry and seperate the skin from the breast. Combine the butter and seasonings in small bowl and spoon the mixture under the skin and rub into the breast. If desired, rub the mixture on top of the skin. Place the seasoned turkey in a dutch oven/skillet that can be covered with a lid. Cover and roast for 45 minutes. Remove the lid the roast for an additional 15-20 minutes. Once cooked through (internal temp 165), remove the turkey and set aside to rest while you make the gravy. Place the turkey skillet on the stove top and heat to medium heat. Add the chopped shallot to the turkey drippings, and stir to combine. Once the shallots are tender, add in the xanthan gum and chicken broth. Bring the gravy up to a simmer as you stir until gravy has thickened. Remove gravy from heat and serve alongside the turkey breast. Enjoy! NOTE: Nutrition is for a 2lb turkey breast (as shown in video). Feel free to use any pre-made seasonings you have on hand!